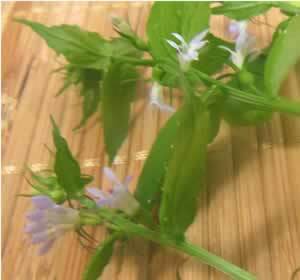 Preparing lobelia as a tea lessens the side effect of nausea it can cause when smoking it. Lobelia has and anti-spasmodic, and expectorant effects, which make it useful in treating asthma, bronchitis and dry, nagging coughs. The herb relaxes both the body and mind, easing tension and stress. I find it combines well with Valerian for inducing restful sleep.